New Wave Mental Maths workbooks will sit comfortably with your mathematics programme. It offers day-to-day activities that cover all mathematic strands and are developmental throughout each book and the series. It is written to provide comprehensive coverage of mental maths concepts in the Irish mathematics curriculum. It provides opportunities for consolidation of mathematical concepts to develop and maintain speed of recall. It includes opportunities for reinforcement of ongoing mathematical concepts. You can introduce, practice and understand a range of mathematical vocabulary. It also offers sequential development of mathematical concepts and vocabulary. You can develop and reinforce problem-solving strategies. 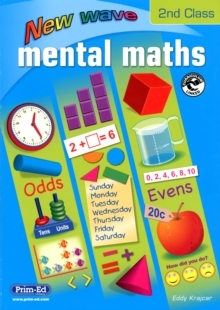 It also provides a structured daily mental maths programme for the whole academic year. It also contains pictorial, graphic and written representation of problems. It features: simple weekly pupil and teacher assessment (1st and 2nd Class books); and an inbuilt review and assessment programme (3rd - 6th Class books). It offers wide curriculum coverage that aids identification of 'problem' areas of maths, to help planning and assessment. It also features clear two-colour presentation throughout. It provides record pages. It covers all mathematics strands and strand units applicable to mental activities. It also includes pages of useful 'maths facts'. It also provides weekly testing/review for books 3-6. Developmental books provide ideal opportunity for differentiation, with pupils working on a level appropriate to their ability rather than age. Comprehensive teachers guide is available.